Write Bloody Publishing, 9781938912832, 95pp. 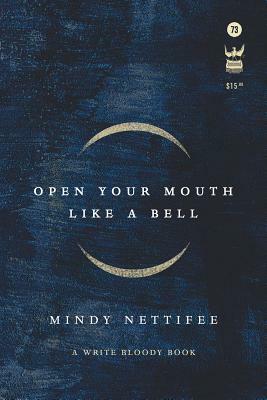 Open Your Mouth Like A Bell is ultimately a book of love poems to poetry itself, or rather, to the gift of language and its powerful mercury. "Sincerity is the only currency I bring," writes Mindy Nettifee in her haunting poem Election Eve, a piece composed in a state of not-knowing, just days before the 2016 U.S. election that delivered the presidency to Donald Trump. In this third full-length collection of poetry, Nettifee's powers are on the wax. The book follows a course of descent, tapping wells and constructing thresholds to underworlds. She's plumbing the dark unknown, in search of wild memory and buried trauma and the stories of the dead. She is seeking the roots of the personal, familial and cultural madness blossoming aboveground. Her studies of the unconscious mind, archetypal psychology and western mysticism are in conversation with punk chaos, feminist politics, and the evolution of kissing. The lineage of poems as spells is humming and cracking beneath the surface, asking questions about what it takes to imagine, create and enact change. Nettifee won't banish the mystery, but does not leave us in the dark. By the end of the book we are led up and full circle, reinitiated into the bright, light-filled, mundane world. Only everything has changed. Here, in the surreal real and the strange and sacred ordinary, we must use our own voices to emotionally echolocate, to sense new landscapes both inside and out. We must tell the stories it is impossible to tell. We must speak until we feel the ring of truth.